How's your week going, friends? Mine has been a bit of a blur, with the snow, the unseasonably cold temps and topped with a touch more snow. What month is this, anyway? Typically by now I'm enjoying sunshine on the deck, so I took matters into my own hands yesterday.. The first dinner Dan ever made for me involved cranberries and chicken. I remember being impressed that not only was he making me dinner, but that he was using such an unconventional ingredient to go with the meat. 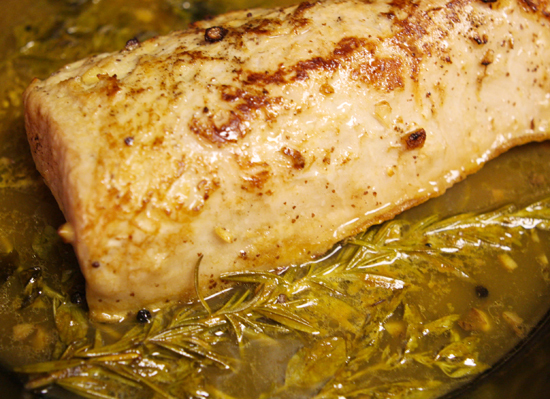 Pairing a Pork Loin with a delicious sauce is important and this Orange-Herb Sauce keeps the meat from becoming bland. You’ll enjoy how easily it puts together and how rich it makes the meal! The sweet citrus aroma in the kitchen will remind you to make this meal again. Oops, I’ve cooked pork two weeks in a row for my family. Isn't pork delicious, though? My mother prepared it a lot growing up. She really only prepared it one way, but that one way was fabulous. As with everything she makes, I am constantly striving to achieve the flavor that she achieves. In the past month, my husband and I have prepared a lot of pork and I feel confident saying that we have gotten close to Mom's level of pork deliciousness. This recipe is insanely delicious. 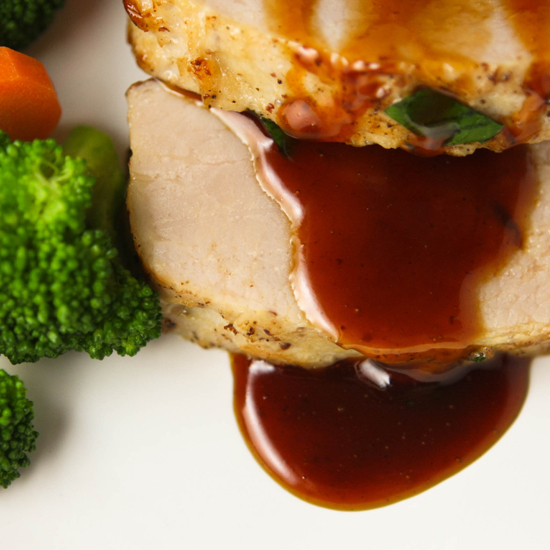 The reduction sauce that swims around the tender, flavorful pork makes me cry tears of happiness. 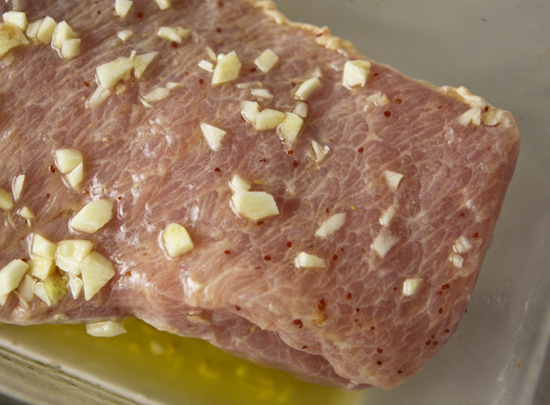 First, you will want to marinate a 1 1/2-pound pork loin. The recipe suggests a marination time of 1 hour, but I let mine sit overnight. 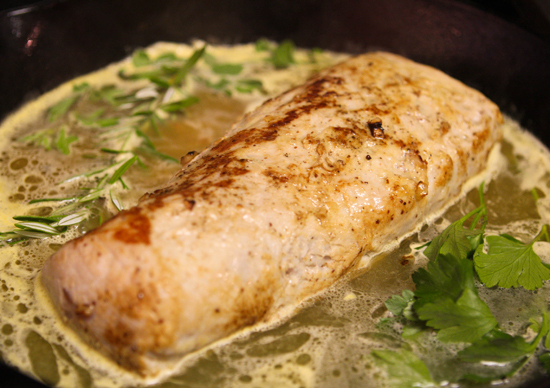 Add the pork loin and coat with the oil-garlic mixture. Place in the refrigerator and flip the pork periodically. Once the pork has had some time to soak in its bath of olive oil and garlic, preheat your oven to 400 degrees F and set a rack in the upper third part of the oven. In a medium ovenproof skillet, heat 1 tablespoon of olive oil. Season the pork with salt and pepper and add it to the skillet, fat side down. Cook over moderately high heat until it is richly browned, about 4 minutes. Brown the pork on the remaining sides, and then turn it fat side up. If I don’t have fresh herbs, can I make due with dry spices? 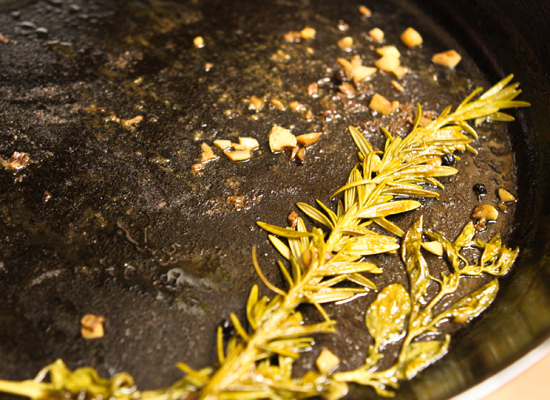 This reduction really does extract so much fresh flavor from your herb sprigs. But yes, in a pinch, dry herbs will due. 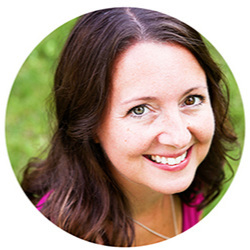 Dry herbs tend to have a concentrated flavor so you won’t trade the measurements equally. Use only about a third of the spice called for when adding dry spices. 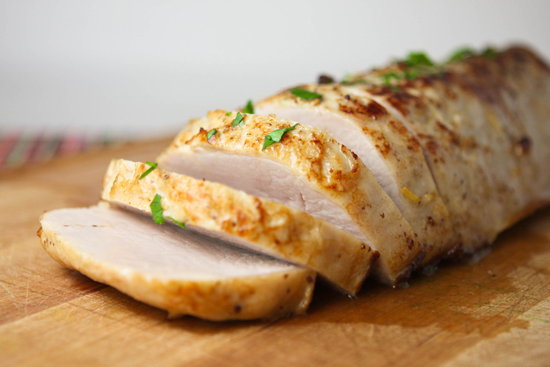 Pork Loin is a flat, tender piece of meat that is sold both bone-in and boneless. It is generally rectangular and wide in cut. You can buy a pork loin as a whole roast. 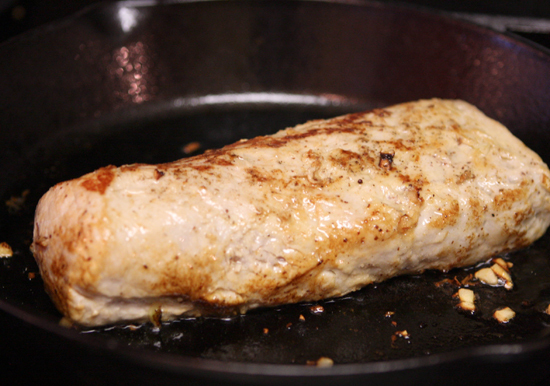 Pork tenderloin tends to be long, round and thin. If I want to cook the pork in a crockpot, how long would I let it cook? You want the internal temperature to reach 145F so after you brown the pork, you can place it in your crock pot and set it to low. Cook it for 6-8 hours, checking it frequently after 6. Once the mixture has reached boiling, transfer the skillet to the preheated oven and roast the pork for about 35 minutes or until a meat thermometer inserted into the center registers at 145 degrees F.
Transfer the pork to a carving board. Carve it into 1/2-inch slices, but you might want to wait to do this until the sauce is nearly done cooking. Do as I say, not as I do. Strain the liquid from the skillet into a saucepan. Allow the sauce to boil and reduce to 1/2 cup. This takes about 15 minutes. Season with salt and pepper and stir in 2 tablespoons of chopped parsley. What? You don't see chopped parsley in my reduction sauce? Well, this is because there is no parsley in my reduction sauce. This was the point in my day where chaos reigned our home. Sammy was screaming for more food, as always. Elijah's potty watch had gone off. I knew I needed to take photos quickly, before the sauce got too thick. My husband's phone rang. AAAGhsdkghhghh! So. I forgot to add the parsley. It sat in a sad pile on the cutting board, and I didn't see it until we were sitting down at the table. Please forgive me. 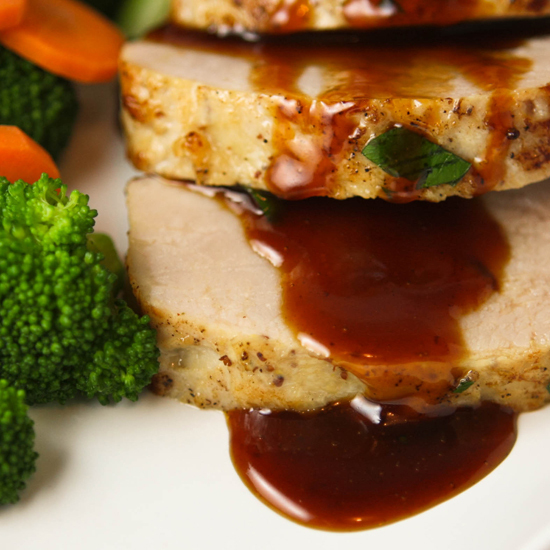 And then drizzle your sauce over the slices of pork that adorn your plates. Did I mention how delicious this reduction sauce is? If I could take a bath in it, I would be one happy girl. In a large bowl, combine 2 tablespoons of the oil with the garlic. Add the pork, turn to coat and let stand for 1 hour. Set a rack in the upper third of the oven and preheat the oven to 400 degrees F. In a medium ovenproof skillet, heat the remaining oil. Season the pork with salt and pepper and add to the skillet, fat side down. Cook over moderately high heat until richly browned, 4 minutes. Brown the pork on the remaining sides, then turn it fat side up. Add the orange juice, stock, wine, peppercorns and herb sprigs and bring to a boil. Transfer the skillet to the upper shelf of the oven and roast the pork for about 35 minutes, until an instant-read thermometer inserted in the center registers 145 degrees F. Transfer the pork to a carving board. Strain the cooking liquid into a saucepan and boil until reduced to 1/2 cup, 15 minutes. Season with salt and pepper; stir in teh chopped parsley. 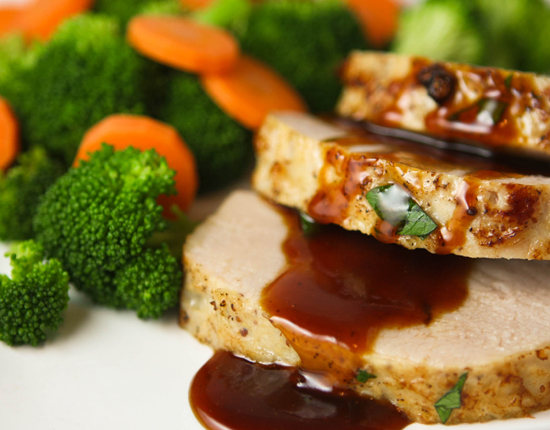 Carve the pork and serve with the sauce.